The histories of Round Hill Church, Round Hill Academy, and Alexander Schools, Inc. are so closely related that one can hardly be understood without some knowledge of the other. The school was a success from the first and at the associational meeting in 1900, the church sent another letter to it saying: “Believing that our greatest success can be achieved through the Green River Association, and feeling that the time has come for us to tender it to the association., we do hereby tender said school building with about two acres of land to said association so long as it keeps and maintains a school. Whenever the association fails to provide a school, then said building and land to shall revert to Round Hill Church.” The association accepted the school, the building, spring, and land. 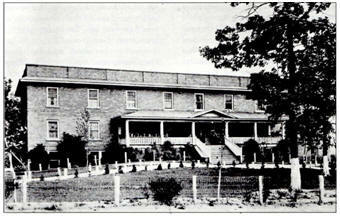 The school continued to grow and it turned out many outstanding men and women of later years. Some of these are accounted for in the History of Round Hill Academy published in 1970 by the Alumni Association of that school. was on the Board of Trustees for many years. In searching for a location for said school, it was found that the Round Hill Academy buildings could be bought, for it was more than $15,000 in debt and was about to close. Mr. Alexander paid off the debt and gave $2,000 more for the running expenses that year. The name was changed to Alexander Schools, Inc., for Motherless Children. The “for Motherless Children was later dropped or no longer used. The word “Incorporated” was added because the idea was that there should be three schools: a school of industry including weaving and associated arts under (at the time) of Miss Irene Picklesimer, a school of nursing in addition to the elementary and high schools. For reasons stated later the school of industry operated only for a limited time, and the school of nursing did not function at all. A small broom factory was built and operated also only a limited time….. This was a frame building and was under the direction of Mr. Oscar Henderson. Mr. Alexander was one of the best known bankers and manufacturers with extensive holdings in Rutherford County and in St. Petersburg, Florida. It was his intention to equip, enlarge, and run the school in cooperation with the Home Mission Board of the Southern Baptist Convention, for the convention had already been largely supporting Round Hill Academy as a mountain mission school. The Certificate of Incorporation was executed by the following: J. W. O’Hara of Asheville, superintendent of mountain mission schools of the S. B. C.; Mr. J. F. Alexander of Forest City; Mr. George Blanton of Shelby; Mr. Gordon Scoggins of Union Mills; Dr. W. A. Ayers of Forest City; Rev. C. C. Matheny, later of Greenville, S.C.; and Mr. S. C. Gettys, cashier of the Bank of Bostic. This certificate was filed Nov. 9, 1925 with the Secretary of State, W. N. Everet. On December 11, 1925, Mr. Alexander died. His death was a great shock but the future of Alexander Schools seemed secure since he had willed an endowment of $10,000 a year for the education of motherless boys and girls. The school year of 11925-26 was under the leadership of Mr. N. R. Prickett. He said that Mr. Alexander’s wish was for him to remain as such, but he did not “see eye to eye” with another official, hence he left after this year. Then Rev. C. C. Matheny was made superintendent and Rev. M.L. Lennon, pastor of Round Hill Church, was made principal of the school. When school opened the fall of ’26, there was a new teacher on the grounds –just having graduated from Furman University, Greenville, S.C. This was a tall, slender young man with slightly stooped shoulders because of a break. This was no other than Willis Sweatt of Union County near Spartanburg, S.C., who for the next twenty-five years was to head the school, though at the time he had no idea of such thing. He came as a teacher of French and science, dean of boys, and athletic coach. 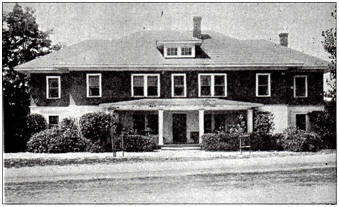 During the fall term of 1926, Mr. Matheny gave up the superintendent’s office and became a trustee. Mr. Sweatt was made superintendent in his place, and when Mr. Lennon left a year later, Mr. Sweatt was given the office of principal. He kept those offices until his death. 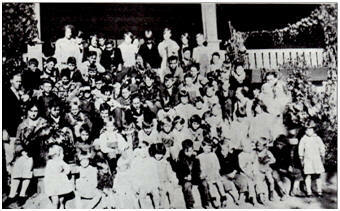 The first children to arrive in 1925 seeking a home came between Thanksgiving and Christmas, according to Supt. Prickett. They were Fred, Harry, and Bill Wise, and a little sister. Their mother had left their father and deserted the children. After several weeks, more and more children arrived. Board did continue to help Round Hill Academy and, later, Alexander Schools for about two years. Then all help was withdrawn. So many high school pupils left Alexander that the high school had to close at Christmas of that year. Yet by the middle of the following summer, so many high school pupils had come as boarding students that the Superintendent reopened the high school at the beginning of the fall term of 1927-’28. Some of the community students who went to Central High after Alexander closed came back. In order to have enough matrons and teachers as well as other workers, more people had to be found. Two sisters from Charlotte were already at work. These were Misses Winnie and Nannie Stroup. Miss Winnie was matron for the older children and elementary teacher. Miss Nannie was dietitian and matron for the smallest children. A Miss Harrill from Forest City was also her for a short time. Then Miss Alice Grant (now Mrs. C. C. Nanney) was secure to take charge of the smallest children. Miss Nannie Newsome came from South Mountain Industrial Institute in another part of the county. This was a school similar in nature to Alexander. She came in August of 1925 and has been here since except one year when she had leave of absence to study in college. She was a teacher, office typist, and matron for the large boys. A month after school opened, the elementary school was getting so large that Miss Mary Grigsby came from Cadiz, Kentucky to be an elementary teacher and matron of the largest girls. She became teacher of Bible, math, Latin, and other high school subjects as the need arose. After six years, she gave up matron’s work and used her time in teaching and church work. She retired in a small house she built on “Brissle Ridge”, and worked as church secretary as long as her strength allowed. She died in November, 1972. As the school grew and more workers came, there were too many for this write to remember nearly all of them. She will name a few. First of this is Mr. W. A. Smith from South Carolina, who came in 1929 to assistant to the superintendent, teacher, and coach. Miss Mell George (later Mrs. W.E. Sweatt) came that year also to be a teacher and matron for the junior girls. Miss Florence Reid returned (she had taught in the academy) in 1930. She taught mathematics and was office secretary. 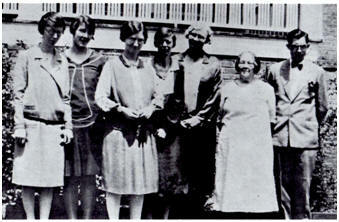 Miss Allie Smart (now Mrs. Paul Brown) came in ’29 as librarian and teacher of Domestic Science. Miss Annie Dee Lancaster from Georgia was matron for the largest boys and teacher of seventh grade. 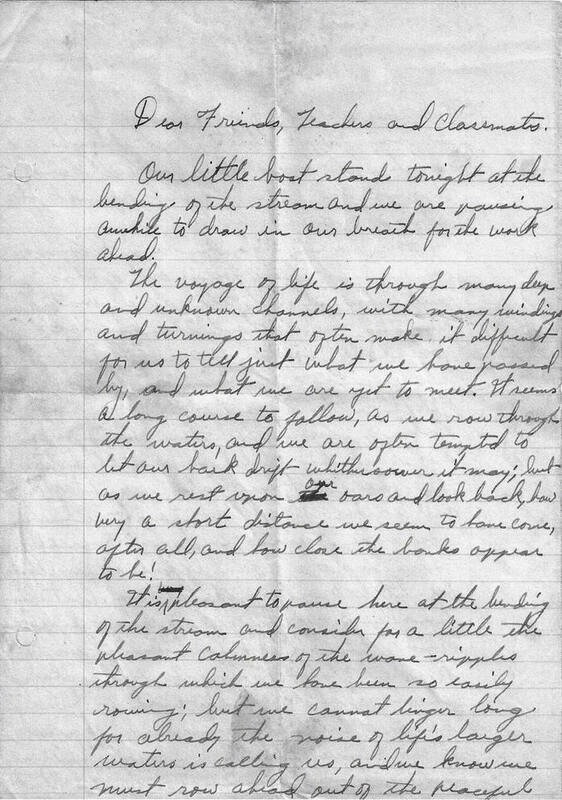 “Mother Hardin” was dietitian, and Miss Cleo Barnes, an ASI graduate, taught music after 1929. Miss Pearl Sweatt supervised the laundry. 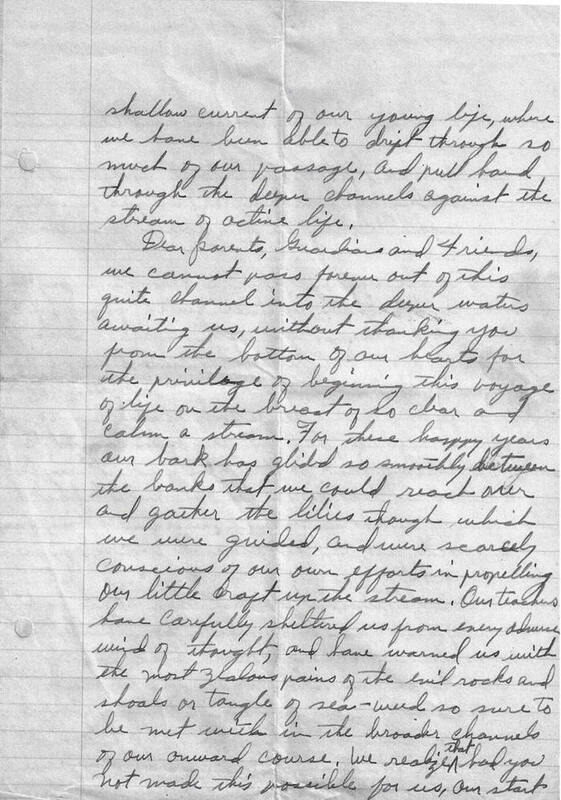 A recent letter from Miss Lancaster gave this account of her years here: “In January, 1930, I resigned the school her to go there as I felt that I could accomplish more humanity. I taught the seventh grade the whole time I was there. I served as housemother of the largest boys in the old Brown House for eight years. Mr. Aiken Smith was the disciplinarian of the boys. It was my duty to inspect the boys’ rooms each day and report to Mr. Smith when they failed to clean them. I was also responsible for the evening devotions after supper. I enjoyed working with the boys, but my classroom work and my matron’s job became too wearing so Mr. Sweatt relieved me of that part. I also taught junior boys in a Sunday school class and helped with the B. T. U. work.” Miss Lancaster worked with the school eighteen years, and a most efficient, helpful Christian worker she was. She went back to Hawkinsville, Ga. She still resides there though she says she will be eighty-eight in a few months. 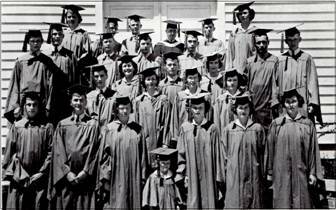 The first graduating class was in 1929. This was a small class of ten. They were Cleo and Pauline Barnes, Mary Bartles, Thelma Bowie, Fern Briscoe, Bessie Buchanan, Beth Flack, Nita Koon, Cread Nanney (class president) and Alton Tate. Nita Koon became a teacher after attending college, and for thirty-nine years worked with the school. A part of those years she served as matron for small girls. After her father’s death, she went home to live and commute to the school to teach. Cread Nanney, after attending Mars Hill College, returned here to work and here found his wife, Miss Alice Grant. Two members of the class have died – Bessie Buchanan and Fern Briscoe. Alton Tate is in a rest home in Forest City. All of the ASI children attended school on the campus, as did the high school students from the community. The latter paid tuition because this was a private institution. It became fully accredited and one was proud to hold a certificate from it. It offered courses in Home Economics, Commercial business, Agriculture, and Bible in addition to the usual subjects taught. No state school at this time had more than eleven grades. The twelfth grade was added in 1945-46. More land was bought as it was needed and much repair work had to be done on the buildings. 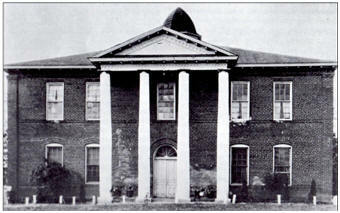 In the early days, the expectation was that the school would receive money from the endowment of the property in Florida, but conditions there prevented this; hence the institution was thrown into $12,000 in debt. Then came the depression, and it took courage and business sense to keep going. One small relief came in 1932 when the public school in Union Mills and the Alexander Schools instruction department were consolidated. Thus the campus school became a state school and the teachers were paid by the state rather than by ASI. This change brought about others. The elementary students of the boarding school went to the “public school” except the first and second grades. The superintendent of ASI served as principal of the entire district – colored as well as white. 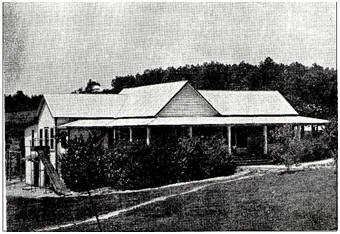 During those first ten years the school acquired fifteen more acres of land – seven of which were in cultivation. During the summer months the boys cultivated this land, growing many vegetables which were used on the tables to reduce the grocery bills. This also educated the young fellows in how to cultivate land and served as employment for them. Miss Alice Grant (who married C. C. Nanney) with Clifford Crawford, Rosie Mae Shumate, Mary Baity, and an unidentified child – Summer, 1930. At the beginning there were four buildings: The Morris Home for Boys, the administration building, the Liberty Memorial Dormitory consisting of three floors, and the broom factory. The two upper floors of the Liberty Dormitory served as dormitory space for girls and the smallest children, and the lower floor, half below ground, served as a dining hall, infirmary, and laundry. Later the infirmary was moved upstairs, and Miss Maggie Sweatt, now Mrs. F.L Weaver, was employed as the full time nurse. These buildings were equipped with steam heat, electric lights, and running water. The electric lights and water were furnished by a Delco Lighting system. Morris Home was heated by hot air, and the administration building by pot-bellied stoves burning coal. The superintendent bought cows to furnish milk and a horse to plow the garden, and built a barn to take care of the animals. The boys milked and otherwise attended the cows and took care of the horse’s needs. He bought pigs and raised them on waste from the kitchen mostly. It was a great day when hogs were killed, and fresh sausage and other meats were put on the tables. “Mother Hardin” was a great cook and she could make tasty food of almost anything and every- thing. The school also had chickens which furnished eggs as well as meat occasionally. Boys continued to come in greater numbers than girls; hence more room was needed for them. 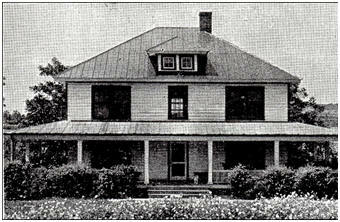 A small dwelling house standing adjacent to the campus was bought and made ready for boys to live in. This house was very close to the road and in a few years a Mr. Gould, a wealthy man from New York City, took an interest in the school and furnished the money to have this building moved farther back and enlarged. Thus it became known as Gould Cottage. Mr. Gould did many other things for the school from time to time, among which was to buy beds for the Morris Home for Boys. These were badly needed, for those left by Round Hill Academy were in bad condition. The next building to be added was owned by Rev. M. L. Buchanan, brother to Dr. Buchanan, who lived across the road. Rev. Buchanan was leaving this fair city and since his house was a large two-story one, the school bought it and converted it into a dormitory for the largest boys. 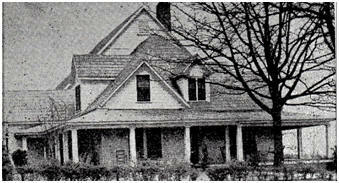 Because the house was brown, it was called the “Brown House.” Mr. Gould paid for much of the cost of the project, and the official name was Gould Dormitory. Thus two buildings on the campus were named Gould. All athletic work was done out-of-doors prior to 1931 when a new gymnasium was finished, providing an in-doors playing court and spectator stands. 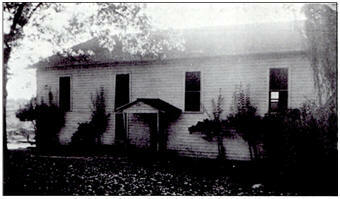 The gym- nasium also provided a two-story construction on the east end which served as classroom and, for two years. , as the Home Ec. Department. Hot- water showers were provided in the basement. This gym remained in use until it burned early one morning in 1952. From 1929 to 1935 Miss Allie Smart taught Domestic Science or Home Economics in a classroom on the first floor of the administration building. Miss Edith Johnson, who followed Miss Smart, taught, as has been said, two years in the upper floor of the gym. Her first year she had only one Home Ec. Class; hence she taught biology and science. The second year she had H.E. classes and taught biology only. Her third year the Rock building was ready and she moved into it. Then she added the third year of H. E. and had the first boys’ class of H. E.
The next constructing that was done after the gym was the first baby cottage. It was across the road to the left of the Morris Home for Boys. Miss Alice Grant was matron. Although this building was not right at the road, the children would play near the road. Therefore Mr. Sweatt, not long before his death, became afraid that the children would get into the road where there was much more traffic than when the cottage was built. If they got in the road, there was a good chance, of course, that one would be hurt if not killed. To avoid such a catastrophe, he put up a brick building back of the kitchen and dining hall so that they would be completely away from the road. Because the school not longer has babies or children under school age, that building is now used for living quarters for the oldest girls. As the years went by, more girls came and more room had to be supplied. When Dr. Buchanan died, his house was bought and converted into a dormitory by adding a two-story section to the back of the house. Here the largest girls made their home presided over by Miss Pauline Lawson, who had been here off and on since 1930. 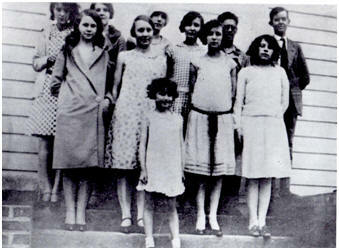 However, Miss Johnson also was matron for these girls a few years in the late thirties. At last a new laundry was built. It had out-grown its quarters in the east of the Liberty Memorial Dormitory and for a few years used the old broom factory after the machinery for making brooms was sold. It did very well with new irons and ironing boards, as well as washing machines. But such a building will give way, so a brick structure was erected. This building was a two-story house. The ground floor was used for the laundry and the upper floor was used for the music department which provided practice rooms as well as a large room for chorus work. In the west end were living quarters used by teachers or workers of some type. Larger and more modern equipment was secured for the laundry. This made the work faster and lighter. Though the music department was later removed, the other rooms are still in use as living quarters. This history would not be complete without mentioning the “Blue Goose.” This was a second-hand bus purchased for use in many ways. Not all of life was work in those days, for there were many ball games elsewhere that our teams attended and engaged in too. Then on Saturday afternoon, if the pupil had the price of the picture show, this old bus conveyed them to Rutherfordton to attend. The name “Blue Goose” was given to it because it was painted blue, not because it could fly. It served for many years, but finally met its doom in 1947 one night on a bridge west of Marion. The ball teams had been to Old Fort to play, and on the way back they me a Youngblood transfer truck on this bridge. It was never known what happened, but our bus was demolished, and quite a few members of the teams were put in the hospital in Marion and were treated for cuts and bruises. The worst injury was received by Coach Lawrence Atchley. He stayed in bed several days on account of it. In those days every child that was old enough was assigned to a task for a month. A list was made out for each dormitory and for the kitchen. In addition to house duties, some of the girls made bread, some served as waitresses, and some were assigned to the laundry where they ironed for the student body. Boys helped with dishwashing as well as pots and pans and the bringing of food from Mr. Morgan’s store. Mr. Morgan ran a little store a few hundred yards down the street. From there the boys brought flour, sugar, meal, etc. They also milked the cows and took the milk to the kitchen. They fed the horse and slopped the pigs. One ran the gasoline engine as long as it was used. Not everyone could do that so Ralph Smith had that job. He was called “Evolution” because some of the boys claimed that he had some features like a monkey. Lewis Throneburg, a big fat boy, who was about the most mischievous of any boy here, helped sometimes with the engine. Two boys went each day to a neighbor’s house nearby to get butter and buttermilk. If ditches were to be dug, the boys learned to do that. That was also given as punishment for some misconduct. If repairs were to be made, sometimes they helped Mr. Guffey and Mr. Keeter do it. In this way they learned a little carpentry. For some years each matron of the larger children supervised a study hall in or out of their rooms at night, but after some years Mr. Sweatt took the high school boys to the school building and supervised them himself. When study hall ended, if he wanted talk with a boy about some misconduct, or give an inspirational talk, he would call that one into his office. In that way he led many to aspire to higher things and directed many to college. Prior to 1934, Mr. D. S. Mashburn lived “down town” and owned the telephone system. This was quite different from what we use today. Each home or business place that had a phone had a box about two feet long hanging against the wall. On one side of the box was a receiver hanging in a hook. If you wanted to make a call, you took down the receiver and rang a crank on opposite side of the box. The ring went to the “central” which was in Mr. Mashburn’s house. You told the central whom you wanted to talk with and she rang the person and connected you to him. Every person had a certain number of rings, but everyone on the line could pick up his receiver and hear what was being said. This served as quite a pastime for the country people. No one was ashamed to tell you that he listened in. Sometime the whole line would take their receivers down and have a general conversation together. If the call to central was for long distance, she knew how to connect you with that person too (after a while). The school folks and some of the community ones too, knew that there was a better telephone sys- tem; hence they made efforts to get it. In 1934, the Southern Bell Company offered Mr. Mashburn a price for his line and he took it. That was the beginning of our present-day telephone system. Mr. Smith set about to train basketball teams for both boys and girls, but Miss Mell George soon worked with the girls. He had a unique way of training – but a very effective way – for he had winning teams. His players did not receive a scolding when they made an error, but they were shown how to avoid such in succeeding games. That caused them to work harder to make no mistakes. All of the playing was done on the ball field outside, but in 1930 a gymnasium was started and finished the following summer. The girls had been playing in “bloomers,” but now that we had a gymnasium, the coaches secured regular uniforms for both teams. Funds were too low at that time to furnish foot-ball suits, but the boys did receive some training in that sport too. In 1935 the boys won every game in the county basketball championship games, and the girls came out second. In Marion in 1934, we engaged in a tournament in which one of our girls, Virginia Queen, was crowned queen of the tournament. Many were the honors our teams won from time to time. As has been said, the dining hall was on the ground floor of the Liberty Memorial Building. With more children coming in all the time, more space had to be provided for dining, cooking, and storage. Hence when Mr. Roosevelt went into the office of President of the United States and put young men to work on public works projects, Mr. Sweatt asked the men of the community to furnish logs for a new dining hall and kitchen. This they did and the free labor of the WPA built it. This was an octagon-shaped building and was the admiration of many. A man from New York visited the campus and commented that he had seen many log buildings but this was the most attractive one he had ever seen. The workers also built a log house over the pump nearby. When the kitchen and dining hall were moved into the new structure from the Liberty Memorial Building, the old dining hall was converted into living quarters for small girls. Miss Delia Hyder was made matron for these girls, and she was the only one who served in that place – for some years later, the building burned. 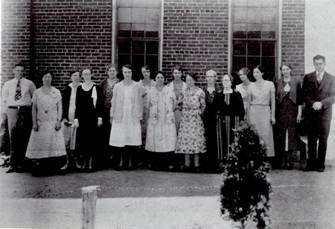 The majority of the lady workers were graduates of the Woman’s Missionary Training school in Louisville, Ky. At one time there were seven such persons working here. Even some who worked in Round Hill Academy were also alumni of this Training school. The chapel programs were led as a rule by teachers, except in the spring semester when each senior had a day. Almost always these programs were religious in nature seeking to influence pupils for clean living and for a life of usefulness. Some of these instructions must have rubbed off for as many as fifteen preachers have gone out from the student body of those days, and three foreign missionaries, as well as an unknown number of teachers including two men who have doctor’s degrees, many bankers, industrialists, nurses, one Hollywood doctor, a few druggists, two airplane pilots (one man and one woman), and a large number of useful citizens whose influence is felt very keenly, where they live. The school offered a medal to the boy or girl who would memorize the largest number of scripture verses and at the end of the year give them with their references. It the writer’s memory serves her correctly, Paul Bowie of Greenville, S. C. gave the most of these in one year. Others are not recorded. When the school opened, a child who was a full orphan or whose mother was dead paid thirteen dollars per month in advance. One whose father was still living paid fifteen dollars. Extras were charged for students who took piano, voice, domestic science, and played athletics. Later all these prices were advanced as money became more plentiful. The students were given a dollar a month for a haircut and incidentals if any was left after purchasing candy at Mr. Morgan’s or Mr. Nanney’s store. 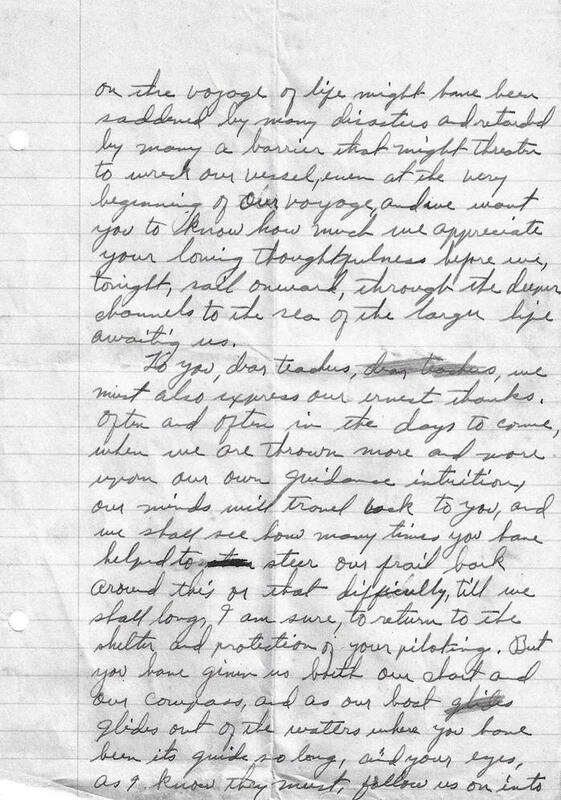 One student wrote recently that his sister used to send him a dollar occasionally, and that Mr. Morgan had the best candy in those days, and that if he were still around, “I would charge him for my dental bill.” The matrons kept the money for the children and gave it out on certain days at “Money Call.” They were taught that a tenth of this money of this money belonged to the Lord and that they should give it to the church. The most of them did that. If a child became very sick, the local doctor was called, though usually Mr. Sweatt took care of him because he had some training in medicine in college. If Dr. Buchanan thought the child should go to the hospital, he was transferred there. These extra expenses were met by the parent, but the Rutherford County hospital was very generous and gave reduced rates to such. Two students died. One little girl four years old from Washington, D.C. developed pneumonia and though a graduate nurse was provided, she died. Then a twelve-year-old boy later died also. He likewise had pneumonia. He was from Greenville, S.C. 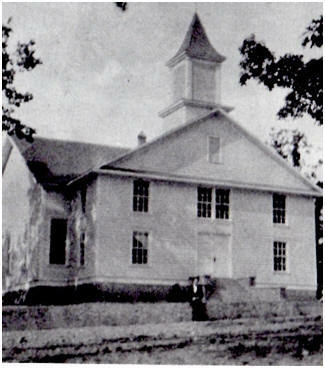 Since the association was partly supporting the school, Mr. Sweatt and some teacher would often take a group of children to some church to sing. We would tell the people of the progress of the school and of the needs. This usually ended with an offering being taken for the expenses of the school. When a church in either the Green River or the Sandy Run association had a special meeting, usually it would invite our chorus to sing. Of course the children liked that for more reasons than one. It meant a trip away from the school and sometimes they would miss a day from school. Usually it meant a good dinner, and that was always a welcome feature. Assuredly the people were especially nice to them, and that made the children feel welcome.